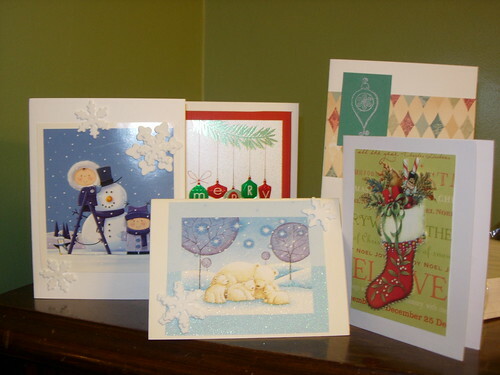 I started making Christmas cards back in November. I collected last year's cards from several friends, intent on remaking them into new cards. It got a bit tedious, so I finished up the cards for my office with regular old scrapbook supplies and blank white cards. a somewhat blurry closeup of one of my favorite cards. 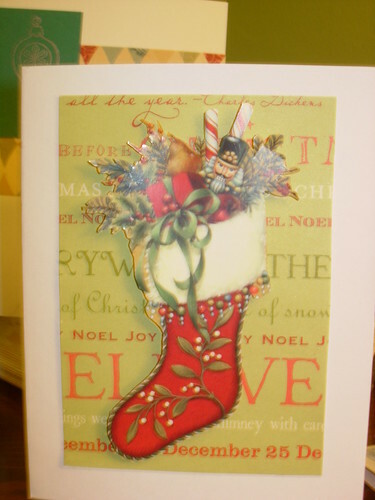 Most of them use the main image from the card, scrapbook paper, and some silver-inked stamps. I scored the stamps last year at Michael's after Christmas in the 75% off sale. I definitely got my $4 worth this year, as I used them in some form on every card! !